Negative thinking is a thought process where people tend to find the worst in everything, or reduce their expectations by considering the worst possible scenarios. This approach can allay disappointment in some situations; but, negative thinking tends to manifest into a pattern that can cause tremendous stress, worry, or sadness over time. The opposite approach would be positive thinking, approaching situations or circumstances with a positive attitude. I just won the lottery. The worst part is that I can't tell my family and friends because if I did, they'd all want some of the money. A new higher paying job would be a good thing except for the change in the commute, possible reduction in health insurance and having to get to know a whole new group of people. I can't imagine why anyone would want to live in a great big house with all that land. All I can think of is the heating bill, and cutting that grass! I'd rather not own a highly successful restaurant. Sure, you could be famous and make a ton of money, but just think of those long hours and dealing with the public all the time. You may say you want a cool sporty car, but I can't imagine paying that car insurance and getting pulled over by cops all the time. It might be nice that I am graduating at the top of my class, but really, what difference does is make when I have to pay back all of these student loans? Dogs could be great companions and really brighten things up if they didn't make such a mess and all that noise. My job pays really well and fast tracks its employees into higher positions since they're growing so quickly, but sitting in a grey, boring cubicle listening to sad FM radio all afternoon from the cubicle next door is just too much. Urban environments are great for restaurants and culture, but why would I live there if I am just going to constantly worried I'm going to be assaulted or my house is going to be robbed? Some people think all of this snow is pretty. I think it just ruins everything. You can't get to work, you have to shovel, and you can fall and hurt yourself. No thanks. Having a king size bed might sound nice, but it just takes up the whole room and the sheets are really expensive. Our trip to the Maldives would have been fabulous were it not for having to spend 14 hours in flight. No sleep, poor airline food, and noisy other passengers were no fun at all. 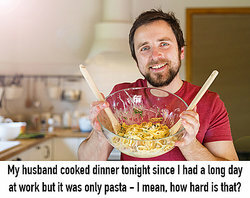 My husband cooked dinner tonight since I had a long day at work but it was only pasta - I mean, how hard is that? I won a brand new computer to replace my old broken one, but it has a whole new operating system that I have to learn now - who has time for that? Now that you have seen these examples of negative thinking, check out some Words that Describe Negative Attitudes. "Negative Thinking Examples." YourDictionary, n.d. Web. 18 April 2019. <https://examples.yourdictionary.com/negative-thinking-examples.html>.